During the first bank holiday in May 2017, 174 members took part in the 24th National Games in Birmingham. Members of all ages, starting from 2 years old competed in a variety of sport over the four day weekend. On the Friday night members from the UK travelled to Walsall, some even making the longer journey from Northern Ireland and further afield. They all embark on this journey for a fantastic weekend not only to participate in sport but to catch up and socialise with lifelong friends. The competition began on the Friday evening where athletes competed in the Power lifting event at the Village Hotel; this was a great start to the weekend showcasing some very powerful and strong athletes. Many athletes lifted much heavier than their own body weight. A big thank you goes out to the guys from Valhalla strength and fitness and as always to the fantastic umpire for supporting this event. Following the power lifting most athletes made the good decision and decided to have an early night ahead of the athletics on Saturday. On the Saturday morning athletes had a very early start, some having breakfast as early as 6:30am. Following breakfast all athletes were fuelled for a busy day ahead, they then made their way to the Alexandra Stadium. Proceedings began at 09:00am with the Mayor of Birmingham saying a few wonderful words and wishing all the athletes the best of luck throughout the weekend. Following this up and coming Badminton player Isaak Dalglish proudly read the athletes pledge. The 24th National Games were officially open and athletes were raring to go and the weather was on our side. It was a great day of competition in a variety of track and field events. There was excellent talent in all age categories and some of these athletes will hopefully go on to compete in the Paralympic games in the future. To end the day the sportsman and sportswoman of the year trophies were handed out. These were decided by a group of trustees and not only go to the athletes who succeed and win medals, but to those who show true grit, determination and sportsmanship. Throughout the day groups of volunteers and officials worked tirelessly in the warm up area, merchandise stand, commentator box and ensuring athletes were in the right place and the right time. A big thank you and pat on the back goes out to all these individual as we could not run such a huge scale event with out there ongoing support. Athletes and Parents all crowded around the podium eagerly awaiting the results of the trophies. Firstly the Sportswoman trophy was awarded to Merryn Binnie from Scotland and the Sportsman trophy to Luqman Abdi, well done to both athletes. As they collected there trophies smiles beamed from cheek to cheek on both of these athletes and I do not think they could quite believe it. Following this athlete made their way from the stadium for some much needed rest. During the evening everyone socialised and had a great evening, whilst some took part in an inclusive dance session organised in the hotel. 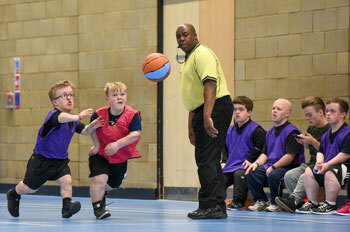 Sunday morning arrived with another full day of sport ahead, this time at Aldersley Leisure village, Wolverhampton. There were some individual and team events on for everyone to enjoy and battle it out for medals. For some of the younger members and first timers we had balance bike and new age kurling, as well as Under 6 and Under 8 Football and Hockey. These were great events headed up by a variety of parents and older members. It was great to see some of the younger athletes confidence grow throughout the weekend, as well as watching friendships blossom. The older Junior and Senior members competed in table tennis, shooting, cycling as well as the team sport’s. There was tough competition in all events and many individuals had to perform at a very high standard to get through the different knock out stages in table tennis. The day of sport ended with a medal ceremony and then everyone made their way back to the hotels for a little rest before getting ready for the Gala Dinner and disco. Members had lots of fun in the photo booth as well as dancing the night away before retiring to bed, some as late as midnight. The next morning, the final day of the 2017 national games began at 9am at Cheslyn Hay school. Lots of members had competed all through the weekend in a variety of different sports, however some came especially for the final day to compete and make a splash during the swimming gala. It was a great event which finished with the young members taking part in the width with and without float. As soon as this finished, individuals got changed before enjoying some lunch before the final competition of the weekend football. There were some great matches and as always lots of entertainment for the crowd to enjoy. The weekend came to an end following the football and final the medal ceremonies but not before the regional trophy had been awarded. The DSA's Regional development officer’s worked out the points for each region throughout the weekend and before some final calculations during the swimming competition they had the final results. One by One the regions were read out starting from last place leading up to first. Everyone listened eagerly for their region to be called. It was time for the top 3 and in third place was Scotland leaving South East and North West to be read out for First place. After ensuring everyone was silent Tom read out second place as the South East region. Meaning the North West had won the 2017 regional trophy. Members from the region chanted and cheered whilst everyone else congratulated them on winning the trophy. After this the final award of the weekend was given out which was the Ellie Simmonds and Matt Whorwood trophy. Unfortunately the winner of this trophy had already left the games, however she had a friend collect this award on her behalf. The trophy was given to Finn Davidge- Hesketh for her excellent performance in a variety of sports, as well as her great personality and can do attitude. The 24th national games came to an end and for everyone involved it was the end of a fantastic memorable weekend. Lots of great memories to take away and share back home. Everyone said their goodbyes and made their journeys back home for some well needed sleep before heading back to school and work to show off their medals. 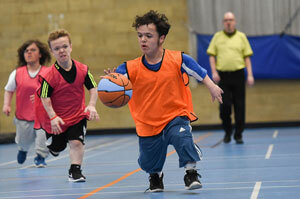 The next stop for athletes from UK is the world dwarf games in Canada taking place between 5th – 12th August .